You know how when you have a site and it’s your site you can do anything you want with it? That’s what I have here. What I don’t want to do is keep updating this crappy challenge thing. All right. Yes, I know. I sound like a quitter. But sometimes you’ve got to quit the things that are making it hard for you to stay focused and do what needs to be done. I prefer to think of my website empire in the making as my own personal thing. Making it public was a bad idea in the way I’m making it public, and frankly, I’m not comfortable with it. I prefer to feel free to talk about my sites and not worry about all the crap that I’m worrying about with them. This post might not ever see the light of day, but getting it down here is helping me to realize a few things. I’m not cut out to publicize my life. I like to make decisions and then reevaluate and having a “challenge” like this is interfering with my methods. Sorry, if you’re reading this, this is the last post on this site before I gut it and do something else with it. 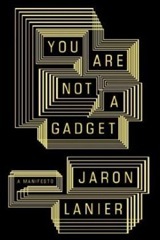 By the way, read You Are Not a Gadget if you have a few hours. It’s quite interesting. It’s unrelated to the topic of this post, sort of, but it did have something to do with my sudden desire to change things up. Google books has pages available to read if you just want a taste of the book.